For empires established by the Göktürks, see Turkic Khaganate. The Göktürks, Celestial Turks, Blue Turks or Kok Turks (Old Turkic: 𐰜𐰇𐰛:𐱅𐰇𐰼𐰰, Kök Türük; Chinese: 突厥/تُركِئ; pinyin: Tūjué, Middle Chinese: *duət̚-kʉɐt̚ (türkut), Dungan: Тўҗүә; Khotanese Saka: Ttūrka, Ttrūka; Old Tibetan: Drugu, tatar: kük törek, bashqurt: kük török) were a nomadic confederation of Turkic peoples in medieval Inner Asia. The Göktürks, under the leadership of Bumin Qaghan (d. 552) and his sons, succeeded the Rouran Khaganate as the main power in the region and established the Turkic Khaganate, one of several nomadic dynasties which would shape the future geolocation, culture, and dominant beliefs of Turkic peoples. Strictly speaking, the common name Göktürk is the Anatolian Turkish form of the ethnonym. The Old Turkic name for the Göktürks was 𐱅𐰇𐰼𐰰 Türük, 𐱅𐰇𐰼𐰰:𐰜𐰇𐰛 Kök Türük, or Türk. They were known in Middle Chinese historical sources as the tɦutkyat (Chinese: 突厥; pinyin: Tūjué). According to Chinese sources, the meaning of the word Tujue was "combat helmet" (Chinese: 兜鍪; pinyin: Dōumóu; Wade–Giles: Tou1-mou2), reportedly because the shape of the Altai Mountains where they lived, was similar to a combat helmet. Göktürk means "Celestial Turks", or sometimes "Blue Turks" (i.e. because sky blue is associated with celestial realms). This is consistent with "the cult of heavenly ordained rule" which was a recurrent element of Altaic political culture and as such may have been imbibed by the Göktürks from their predecessors in Mongolia. The name of the ruling Ashina clan may derive from the Khotanese Saka term for "deep blue", āššɪna. According to American Heritage Dictionary The word Türk meant "strong" in Old Turkic. The Göktürk rulers originated from the Ashina clan, who were first attested to 439. The Book of Sui reports that in that year, on October 18, the Tuoba ruler Emperor Taiwu of Northern Wei overthrew Juqu Mujian of the Northern Liang in eastern Gansu, whence 500 Ashina families fled northwest to the Rouran Khaganate in the vicinity of Gaochang. Peter Benjamin Golden points out that the khaghans of the Turkic Khaganate, the Ashina, who were of an undetermined ethnic origin, adopted Iranian and Tokharian titles. German Turkologist W.-E. Scharlipp points out that many common terms in Turkic are Iranian in origin. As part of the heterogeneous Rouran Khaganate, the Türks lived for generations north of the Altai Mountains, where they 'engaged in metal working for the Rouran'. According to Denis Sinor, the rise to power of the Ashina clan represented an 'internal revolution' in the Rouran Khaganate rather than an external conquest. According to Charles Holcombe, the early Tujue population was rather heterogeneous and many of the names of Türk rulers, including the two founding members, are not even Turkic. This is supported by evidence from the Orkhon inscriptions, which include several non-Turkic lexemes, possibly representing Uralic or Yeniseian words. Göktürk reached its peak in late 6th century and began to invade Sui Dynasty of China. However, the war ended due to the division of Turkish nobles and their civil war for the throne of Khagan. With the support of Emperor Wen of Sui, Jami Qayan won the competition. However, the Göktürk empire was divided to Eastern and Western empires. Weakened by the civil war, Jami Qayan declared allegiance to Sui Dynasty. When Sui began to decline, Shibi Khah began to assault its territory and even surrounded Emperor Yang of Sui in Siege of Yanmen (615 AD) with 100,000 cavalry troops. After the collapse of Sui dynasty, the Göktürks intervened in the ensuing Chinese civil wars, providing support to the northeastern rebel Liu Heita against the rising Tang in 622 and 623. He enjoyed a long string of success but was finally routed by Li Shimin and other Tang generals and executed. Although Göktürk Khaganate once provided support to the Tang Dynasty in the early period of Chinese civil war, the conflicts between Göktürk and Tang finally broke out when Tang was gradually reuniting China. Göktürk began to attack and raid the northern border of Tang Empire and once marched their main force to Chang'an, the capital of Tang. Having not been recovered from the civil war, Tang Empire had to pay tribute to Göktürk nobles. Allied with tribes against Göktürk Khaganate, Tang Empire defeated the main force of Göktürk army in Battle of Yinshan 4 years later and captured Illig Qaghan in 630 AD. With the submission of Turk tribes, Tang conquered Mongolia Plateau. After hard court debate, Emperor Taizong decided to pardon the Göktürk Nobles and offered them the positions of imperial guards. However, the plan ended in an assassination of the emperor. On May 19, 639 Ashina Jiesheshuai and his tribesmen directly assaulted Emperor Taizong of Tang at Jiucheng Palace (九成宮, in present-day Linyou County, Baoji, Shaanxi). However, they did not succeed and fled to the north, but were caught by pursuers near the Wei River and were killed. Ashina Hexiangu was exiled to Lingbiao. After the unsuccessful raid of Ashina Jiesheshuai, on August 13, 639 Taizong installed Qilibi Khan and ordered the settled Turkic people to follow him north of the Yellow River to settle between the Great Wall of China and the Gobi Desert.However, many Göktürk generals still remain loyal service in Tang Empire. In 679, Ashide Wenfu and Ashide Fengzhi, who were Turkic leaders of the Chanyu Protectorate (單于大都護府), declared Ashina Nishufu as qaghan and revolted against the Tang dynasty. In 680, Pei Xingjian defeated Ashina Nishufu and his army. Ashina Nishufu was killed by his men. Ashide Wenfu made Ashina Funian a qaghan and again revolted against the Tang dynasty. Ashide Wenfu and Ashina Funian surrendered to Pei Xingjian. On December 5, 681 54 Göktürks including Ashide Wenfu and Ashina Funian were publicly executed in the Eastern Market of Chang'an. In 682, Ilterish Qaghan and Tonyukuk revolted and occupied Heisha Castle (northwest of present-day Hohhot, Inner Mongolia) with the remnants of Ashina Funian's men.The restored Göktürk Khaganate intervened in the war between Tang and Khitan tribes. However, after the death of Bilge Qaghan, Göktürk could no longer subjugate other turk tribes in grassland. In 744, allied with Tang Dynasty, Uyghur Khaganate defeated the last Göktürk Khaganate and controlled Mongolia Plateau. Wikimedia Commons has media related to Gökturks. ^ a b c Golden 2011, p. 20. ^ Marshall Cavendish Corporation 2006, p. 545. ^ Findley 2004, p. 39. ^ American Heritage Dictionary (2000). "The American Heritage Dictionary of the English Language: Fourth Edition - "Turk"". bartleby.com. Archived from the original on 2007-01-16. Retrieved 2006-12-07. ^ Golden 1992, p. 126. ^ Sinor 1990, p. 295. ^ Holcombe 2001, p. 114. ^ Sinor 1990, p. 291. ^ Vovin, Alexander. "Did the Xiongnu speak a Yeniseian language?". Central Asiatic Journal 44/1 (2000), pp. 87–104. ^ Wei 魏, Zheng 徵 (656). Book of Sui 隋書 Vol. 2 Vol. 51 & Vol.84. ^ a b Liu 劉, Xu 昫 (945). Old Book of Tang 舊唐書 Vol.2 & Vol.194. ^ Liu 劉, Xu 昫 (945). Old book of Tang 舊唐書 Vol.2 & Vol. 67. ^ Ouyang Xiu et al., New Book of Tang, Vol. 215-I. ^ Liu 劉, Xu 昫 (945). Old Book of Tang 舊唐書 Vol. 6 & Vol.194. ^ Liu 劉, Xu 昫 (945). Old Book of Tang 舊唐書 Vol.103，Vol.194 & Vol.195. Christian, David. A history of Russia, Central Asia and Mongolia, Vol. 1: Inner Eurasia from prehistory to the Mongol Empire. Blackwell, 1998. Findley, Carter Vaughn (2004). The Turks in World History. Oxford University Press. ISBN 978-0-19-988425-4. Golden, Peter (1992). 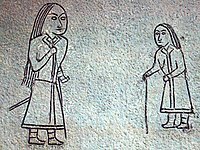 An Introduction to the History of the Turkic Peoples: Ethnogenesis and State-Formation in Medieval and Early Modern Eurasia and the Middle East. Wiesbaden: Otto Harrassowitz. ISBN 9783447032742. Golden, Peter Benjamin (2011). "Ethnogenesis in the tribal zone: The Shaping of the Turks". Studies on the peoples and cultures of the Eurasian steppes. Bucureşti: Ed. Acad. Române. ISBN 978-973-1871-96-7. Great Soviet Encyclopaedia, 3rd ed. Article "Turkic Khaganate" (online). Grousset, René. The Empire of the Steppes. Rutgers University Press, 1970. ISBN 0-8135-1304-9. Gumilev, Lev (2007) (in Russian) The Göktürks (Древние тюрки ;Drevnie ti︠u︡rki). Moscow: AST, 2007. ISBN 5-17-024793-1. Skaff, Jonathan Karem (2009). Nicola Di Cosmo (ed.). Military Culture in Imperial China. Harvard University Press. ISBN 978-0-674-03109-8. Wechsler, Howard J. (1979). "T'ai-Tsung (Reign 626-49): The Consolidator". In Denis Twitchett; John Fairbank (eds.). The Cambridge History of China, Volume 3: Sui and T'ang China Part I. Cambridge University Press. ISBN 978-0-521-21446-9. Wink, André. Al-Hind: The Making of the Indo-Islamic World. Brill Academic Publishers, 2002. ISBN 0-391-04173-8. Nechaeva, Ekaterina (2011). "The "Runaway" Avars and Late Antique Diplomacy". In Ralph W. Mathisen, Danuta Shanzer (ed.). Romans, Barbarians, and the Transformation of the Roman World: Cultural Interaction and the Creation of Identity in Late Antiquity. Ashgate. pp. 175–181. ISBN 9780754668145. This page was last edited on 17 April 2019, at 18:02 (UTC).